Don’t forget, Kellogg Optical Shop sunglass sale underway! 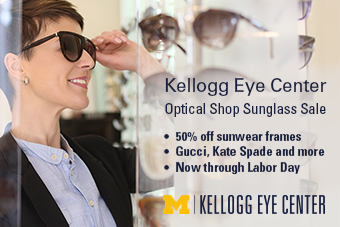 The Kellogg Eye Center Optical Shop’s annual 50 percent off sunwear frame sale is on now through Labor Day! The shop has many designers on sale to faculty and staff, including Gucci, Jimmy Choo, Kate Spade, Fendi, Nike and more. Payroll deduction is available for university employees. 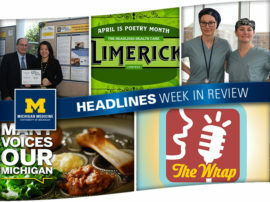 Office hours in Ann Arbor: Monday and Wednesday 8:30 a.m. – 7 p.m. Tuesday, Thursday and Friday, 8:30 a.m. – 5:30 p.m. Call 734-936-6707 for more information. Office hours in Canton: 8:30 a.m. to 5:30 p.m., Monday through Friday. Call 734-844-3251 for more information. Office hours in Brighton: 8 a.m. to 5 p.m., Monday through Friday. Call 810-227-2357 for more information.